While shopping at the red and white circle store (read, Target), I picked up a few things from the card aisle. This was one of them. I considered buying a standard pack of stickers and thought, "Nah! Let's go for the VALUE PACK!" The VP offers 45 stickers inside. The stickers are VERY flimsy and feel as though they were made in the 60's or 70's. They feature a white border with a large player image. The team logo sits in the lower right corner. 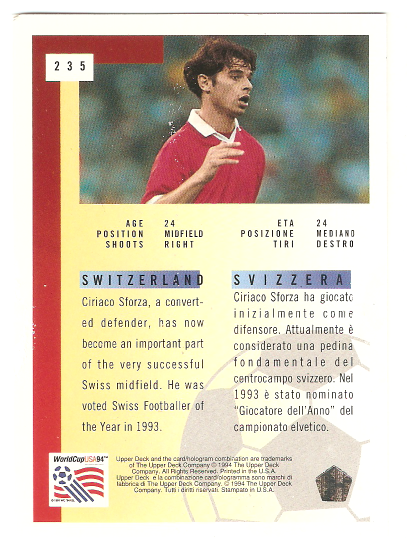 In the lower left corner, we find the position and player's name. 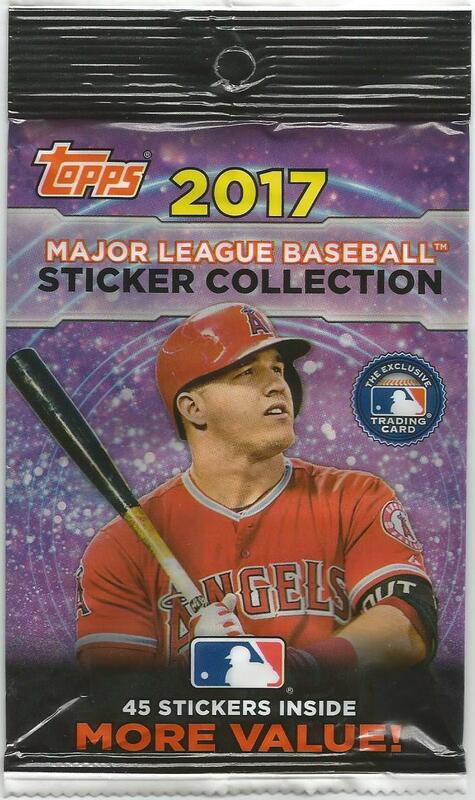 Some of the stickers are team logos and come two to a backing. 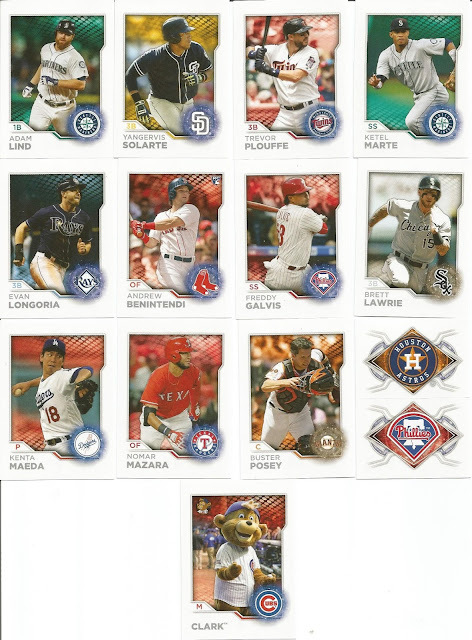 Included in the pack are duplicates of some of the stickers. Frankly, I find that reassuring somehow. 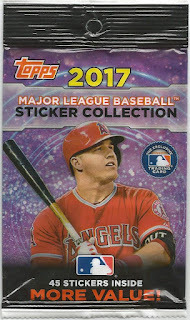 It's a throwback to when I was a kid and would pull doubles from packs with a whole lot fewer cards/stickers than 45. Greetings APTBNL! 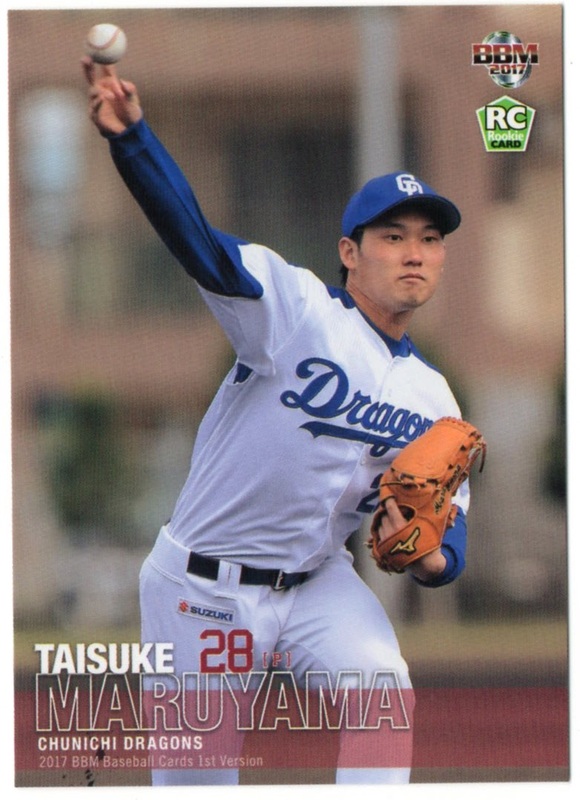 I have been a long-time reader, but Matt recently welcomed me aboard to start opening up some Japanese card packs and sharing them here. I am a sumo wrestling card fan at heart, but love to branch out into other Japanese card genres. I hope you enjoy. 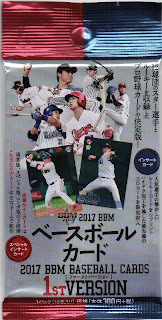 First up is a pack of 2017 BBM Baseball - 1st Version (Series 1). This is a typical beginning-of-season release from BBM that came out the first part of April. 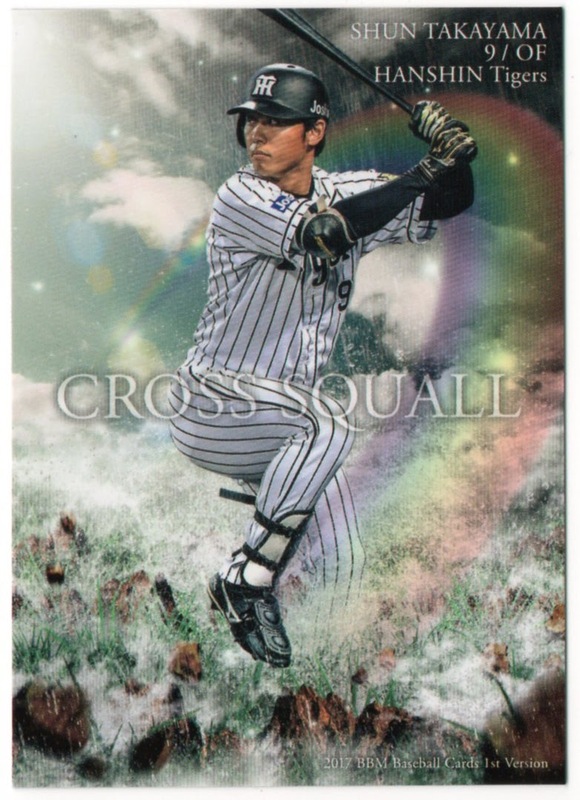 There are 336 cards in the base set with 6 insert sets: Cross Squall, 3D Cross Squall, Hyper Nova, Rookie Card Reprint, Memorabilia Cards, and Autograph Cards. 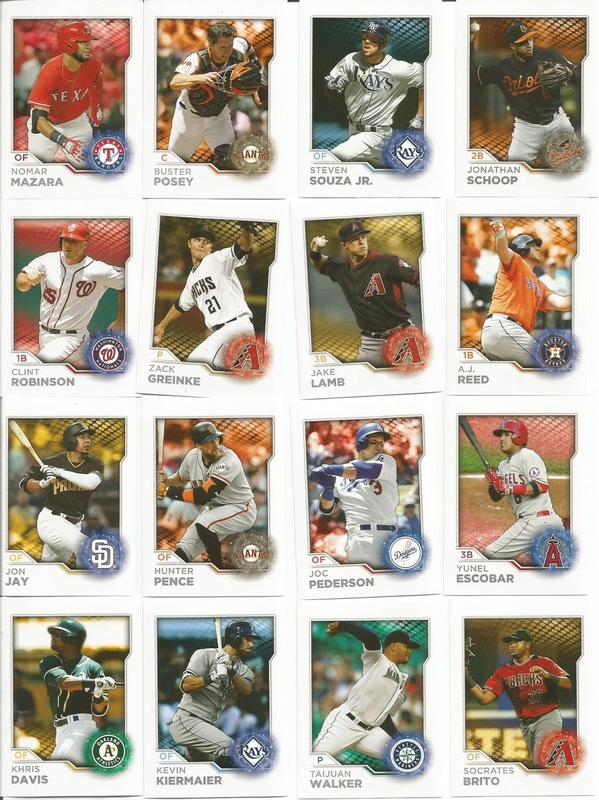 Also included are foil-stamped parallels of certain players which are numbered. 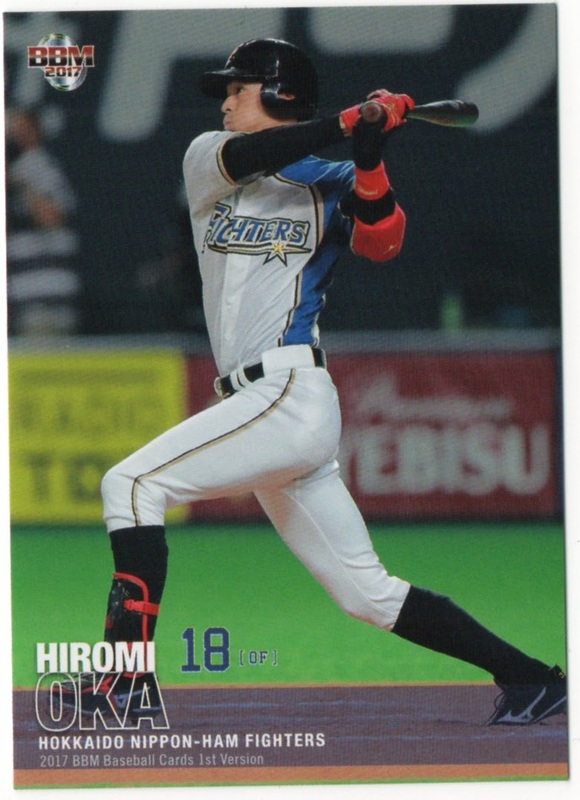 I am not an expert by any means on Japanese baseball and really only follow Brandon Laird of the Fighters so any assists would be welcome. There are 20 packs per box and 10 cards per pack so let's open a pack. 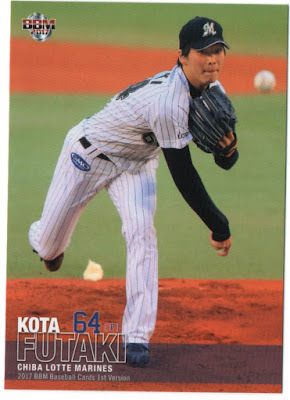 Pack Position 1: #063 Kota Futaki of the Marines...he has pitched in 1 game so far this year. Pack Position 2: #312 Masahiko Morino...a former Olympian and almost as old as I am...although I'd like to think I aged better than he has. Maybe that is a sign of old age when you think younger people actually look old. 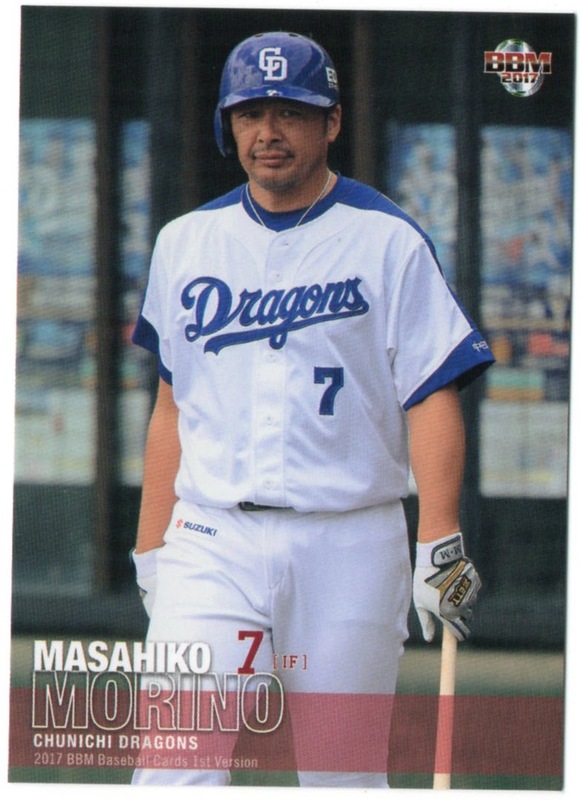 A solid .277 career hitter all with the Dragons...this loyalty hardly happens anymore on this side of the ocean. Pack Position 3: #CS30 My first insert....a Cross Squall card of Shun Takayama of the Tigers. A first-round draft pick and a hot commodity for the Tigers. 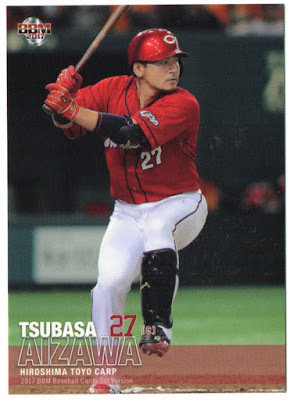 Pack Position #4: #174 Tsubasa Aizawa....Carp Catcher. 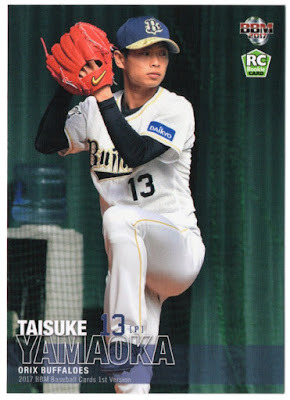 Pack Position #6: #154 Taisuke Yamaoka...another rookie pitcher from the Buffaloes. 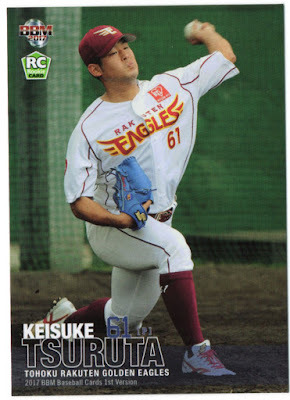 Pack Position #7: #131 Keisuke Tsuruta...a third rookie pitcher in a row..I am on a roll. Pack Position #8: #013 Kensuke Tanaka Gold-Foil Stamp parallel. My best pull from the pack. This has a matte finish on the front and is a little stiffer material than the regular card. 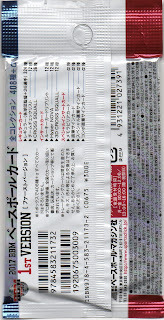 It is stamped #015/100 on the back. 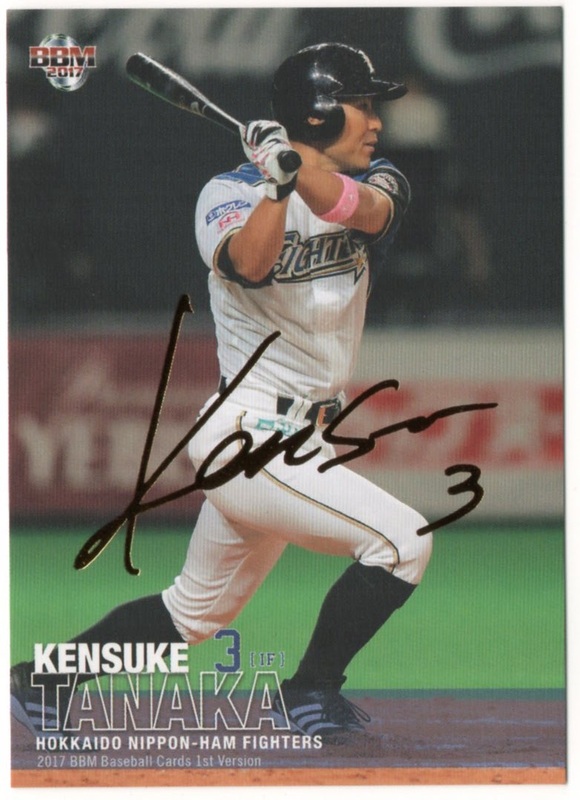 Kensuke is a former MLB player and has a really respectable .284 batting average in NPB action....all with the Fighters except for his short stint in the U.S. in 2014 and 2014. Pack Position #9: #221 Kota Suda of the Baystars. 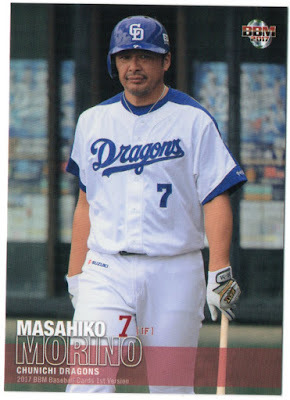 He seems to be struggling this year as well as the Baystars. Pack Position #10: #018 Hiromi Oka from up north and teammate of Brandon Laird. Oka-san, and the Fighters are working at trying to get out of last place in the Pacific Division. 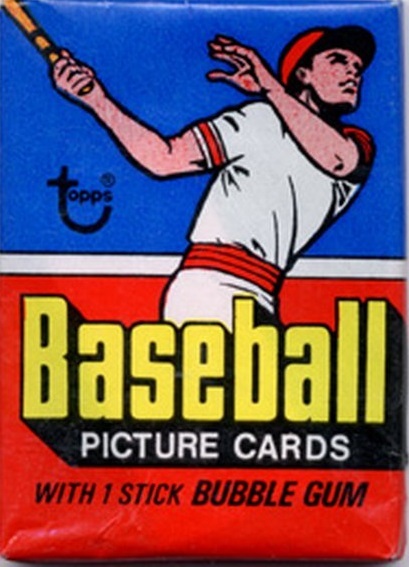 The 1977 Topps Baseball set consisted of 660 cards printed in a single series and sold in 10 card packs (among other ways). 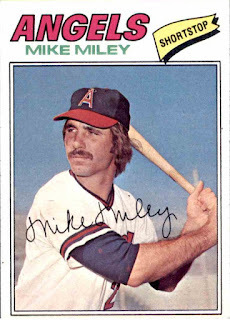 The cards featured a facsimile player autograph (which I always hated). 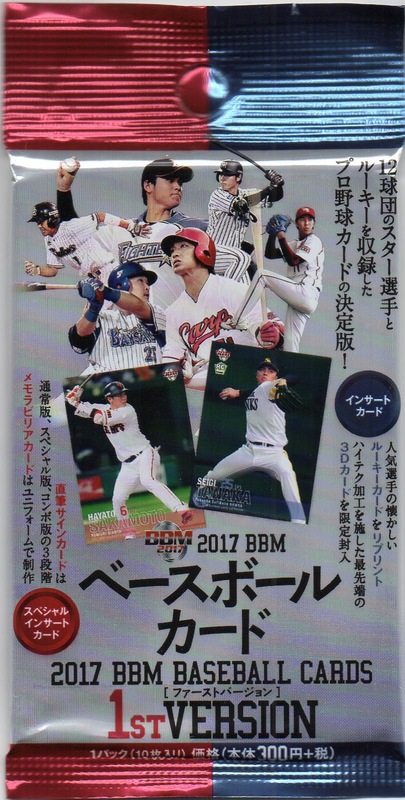 Subsets included the League Leaders, Milestones, Playoff Highlights, Turn Back the Clock, World Series Highlights, Rookie Stars and Brothers. 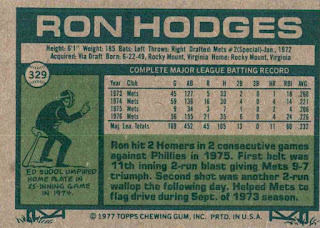 Longtime backup catcher Ron Hodges was in the middle of his career in 1977. 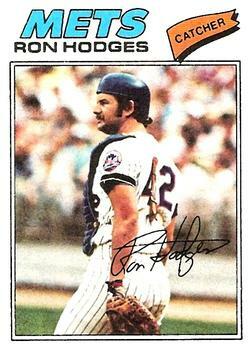 He would go on to induction in my Backup Catcher Hall of Fame. 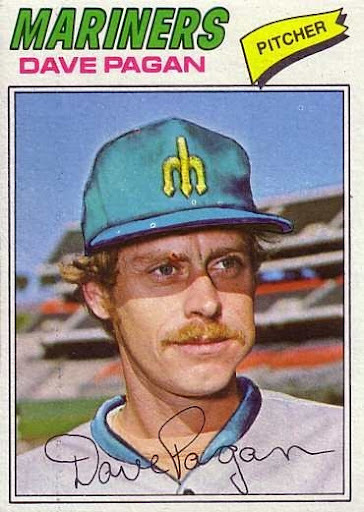 Dave Pagan gets one wild airbrush job for the expansion Seattle Mariners. Pagan started 1977 in Seattle and finished it in Pittsburgh. 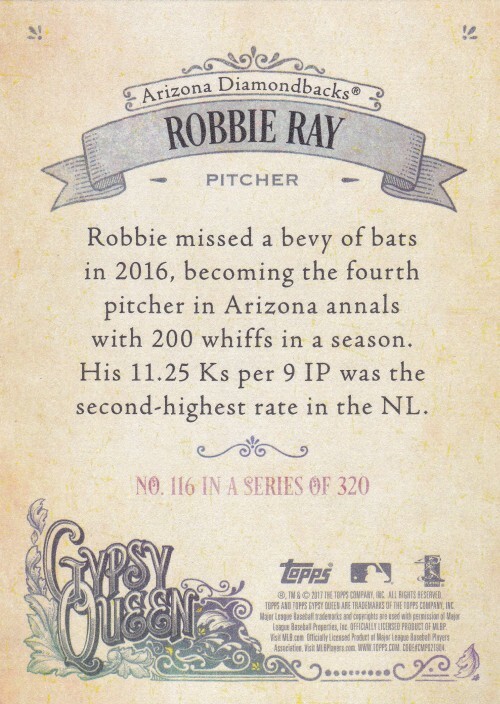 That would be his last season in the majors. 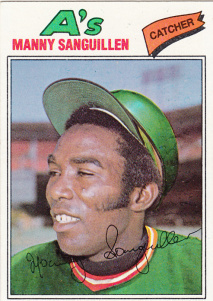 Manny Sanguillen gets a glowing airbrush job to signal his arrival in Oakland. 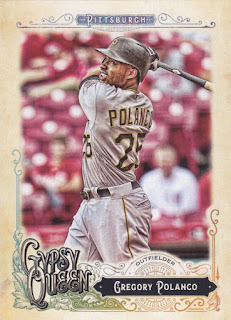 He would spend one season with the A's before rejoining the Pittsburgh Pirates in time for their World Series title. Dave Duncan is yet another catcher and another airbrush job in this pack. 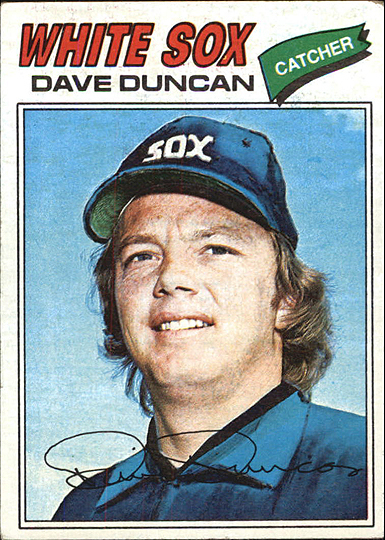 Duncan would never even play for the White Sox after coming over in a trade from Baltimore. 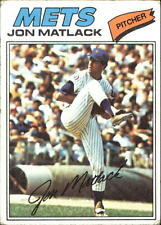 Veteran pitcher Jon Matlack got a nice in-action card. Matlack would be traded to the Texas Rangers after the 1977 season. I hated seeing this xcard. 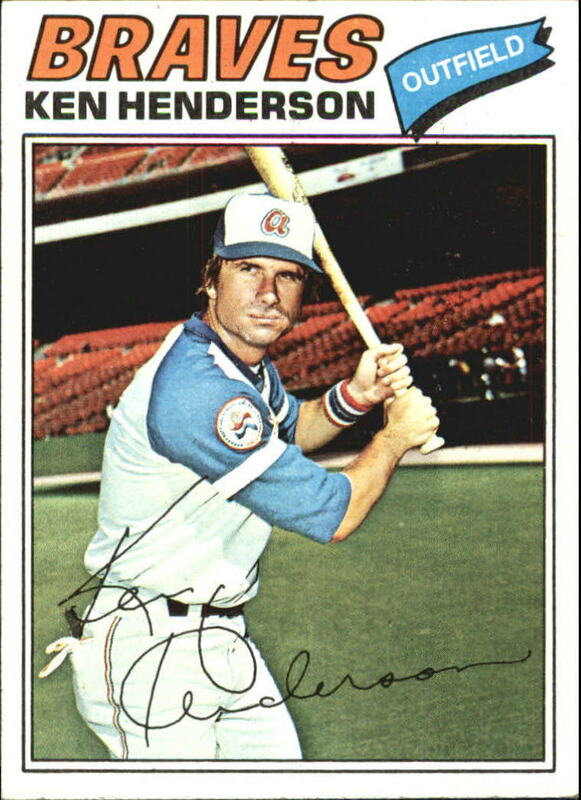 Ken Henderson had been one of my favorite White Sox players. After spending eleven seasons with the San Francisco Giants and the Sox, Henderson would play for five teams in his last five seasons. Enzo Hernandez appears to be warming up on his card. 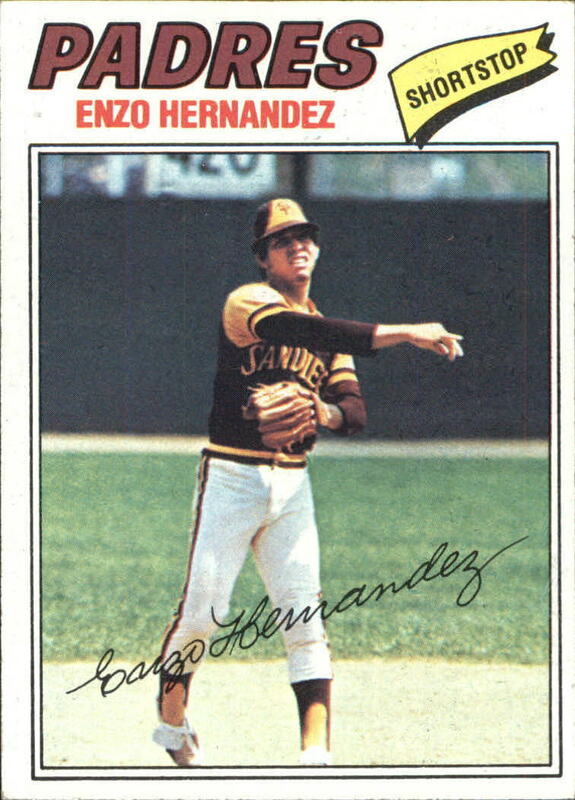 Enzo would play in only seven games in 1977. 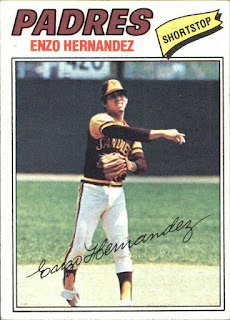 He joined the Los Angeles Dodgers in 1978, but only played in four games, before being released to end his MLB career. 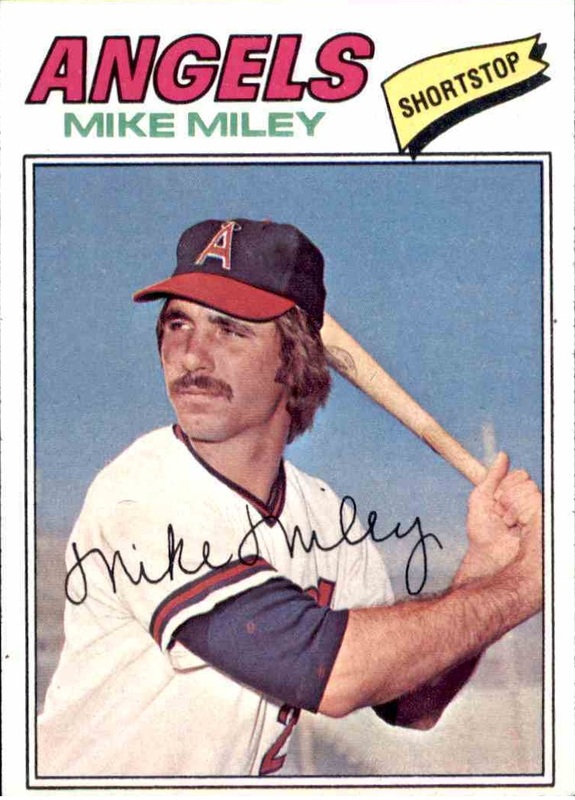 Tragically, by the time of the release of this card, Mike Miley had died in a car accident. Although I hated seeing longtime White Sox favorite Carlos May with the New York Yankees, I did love these brothers cards. 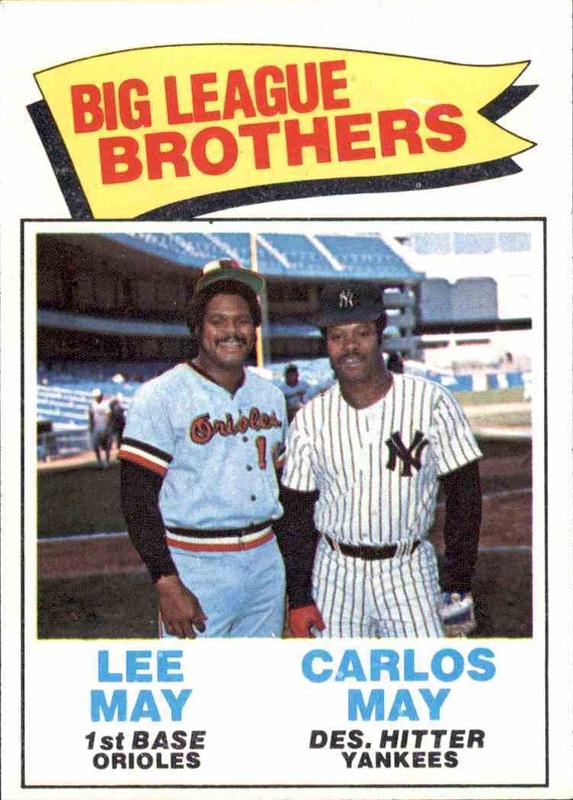 I do have to question why Phil and Joe Niekro did not get one in 1977 and maybe even Jose and Hector Cruz. At least I got a Hall of Famer in the pack. 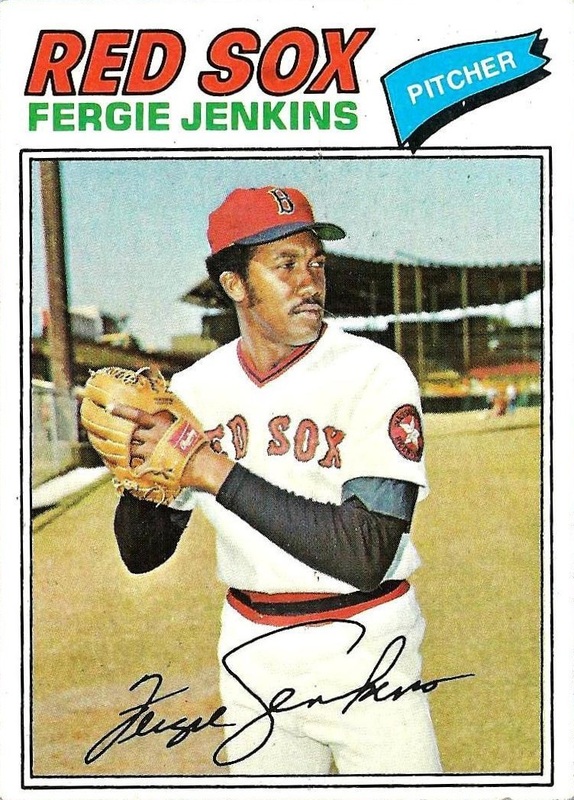 Fergie still had some good years left, but his best years were with the Chicago Cubs. 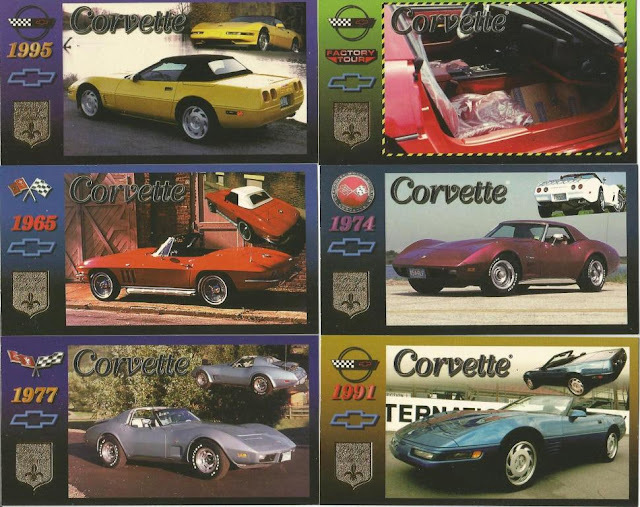 While searching for cards and unopened packs to buy, I came across a pack of Corvette cards I had not seen before so I grabbed them up. Ever since I was a kid in the early 70's, I have dreamed of owning a Corvette. The dream still holds, and these cards - especially one of these cards, as fate would have it - take me to that dream world. There are 8 cards in each pack. The cards are 2-1/2" x 4-11/16" so they are closer to old school Bowman than to standard issue baseball cards. According to the wrapper (which highly foiled), these cover 'Vettes from 1953-1996 and may contain Milestones Chase Cards or Fast Lane Chase Cards. There are also inserts for Factory Tour and Duntov. 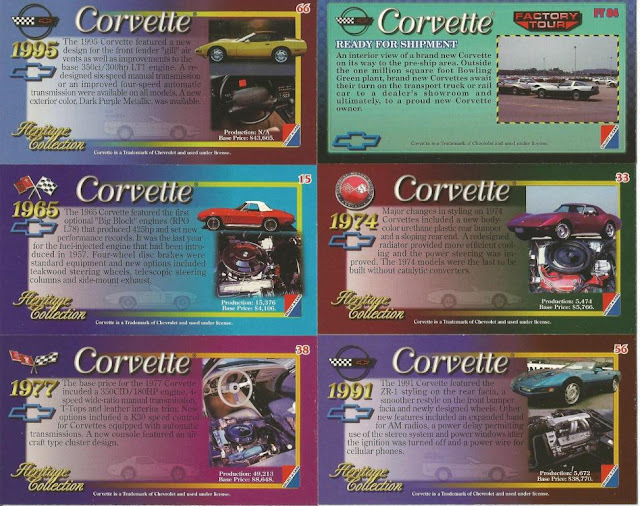 The fronts of the cards themselves feature high-gloss, full color pictures of the featured car, along with the Corvette logo that adorned the car, the year of the car, the Chevy logo, and a gold shield proclaiming "Heritage Collection." Each card has a border that extends into the card in a photoshopper's dream of a project. The very first Corvette I ever actually rode in was my uncle's 1974 brown Corvette. It is the car i would love to start my Corvette ownership with (not his, but a 1974 for sure). My uncle ended up selling his, but I will never forget what it was like to be an 8-yr old riding in that machine. 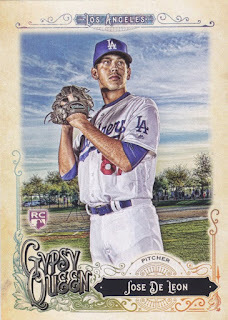 We also pulled another "Factory Tour" card. This one of a C3 (1968-1982) car and a killer 1957. 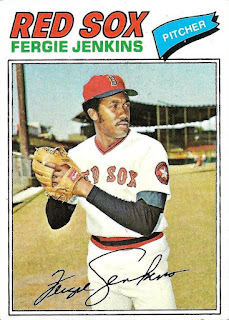 Okay, in full disclosure, of the cards we pulled, I have to rank the '74 as top due to nostalgia, the '65 next and the '57 in third. I mean, seriously, check out the pipes on that '65. Holy smokes! The card backs provide information about the featured car, including production run and base price. Wow, the base price sure has changed since the days of the cars featured here... Though, I suppose comparatively speaking, they are probably not too far off. Then again, today's base 'Vette runs about $55,000. Not sure how that compares to the base price of a 1965. 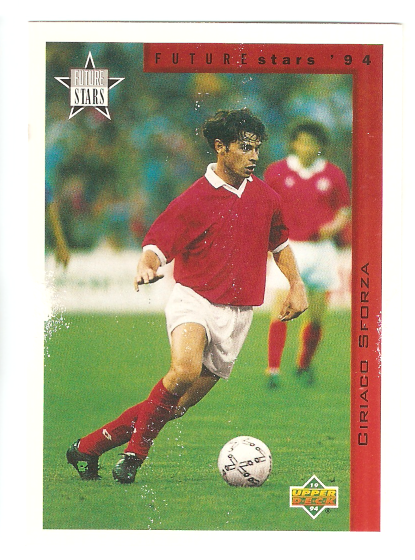 1994 was the year. I had been married just shy of five years. My mind wasn't on soccer. Er, football. Sorry. 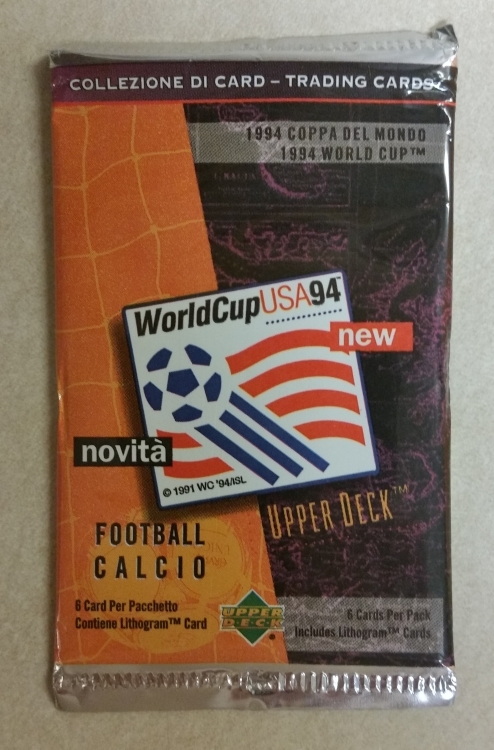 The 1994 FIFA World Cup games were held in the United States. I don't remember them. Madding wondered what the second pack of the "2 packs for a $1 Buck" was. This is it. 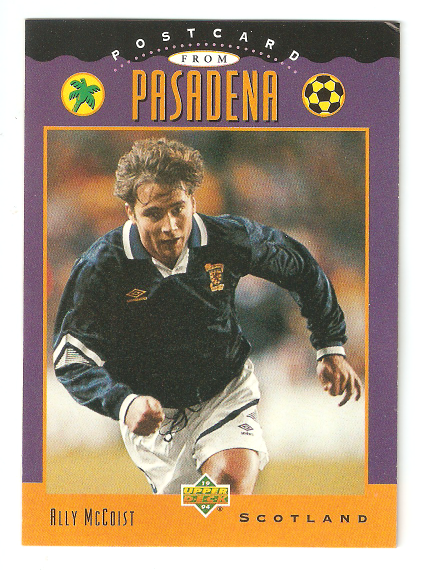 A multi-lingual mish-mash celebrating players I don't know. There appears to be some sort of discoloration on the front and backs of these cards. It is actually where I had to pry them apart. Almost like they got wet and stuck together. 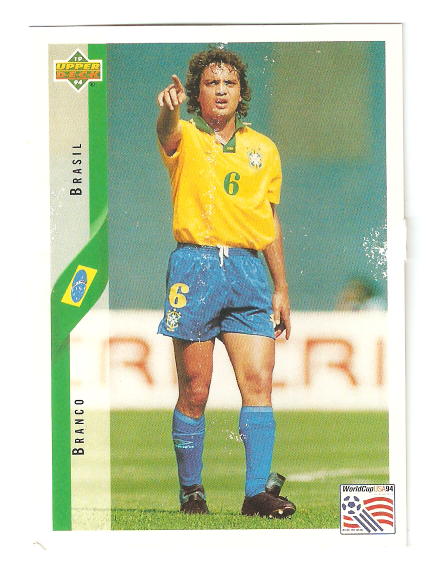 The Great Platini. Starring Robert Duval as Erwin Sanchez. 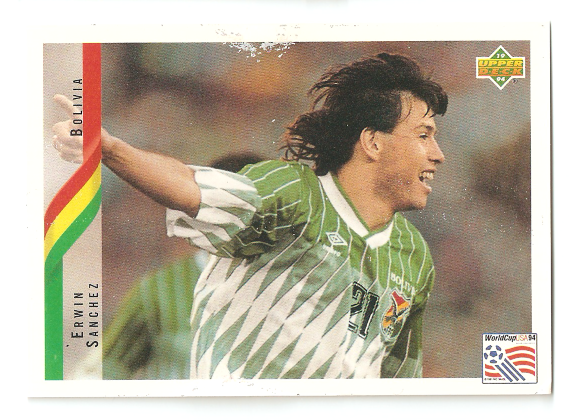 You know you've made it in the soccer world when you have just one name. Think Pelé. Or Messi. 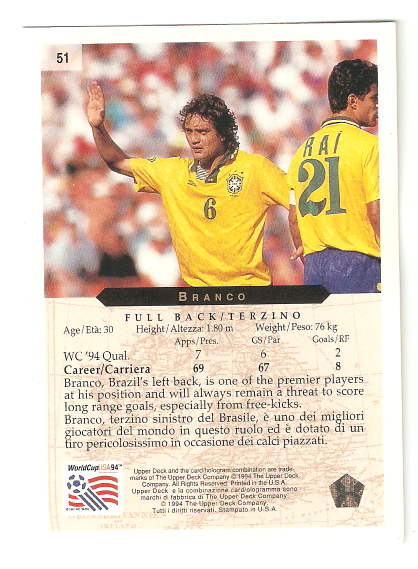 Or Branco. 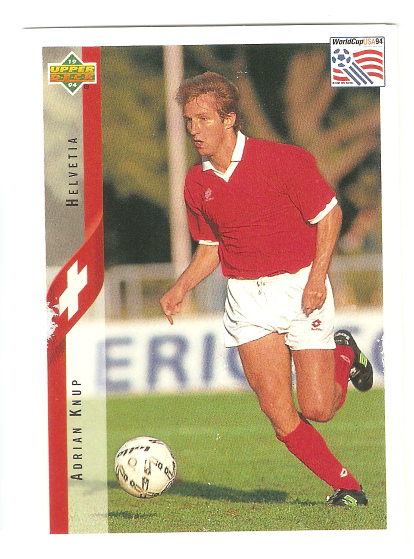 Ah, the mighty powerhouse of soccer that is Switzerland. 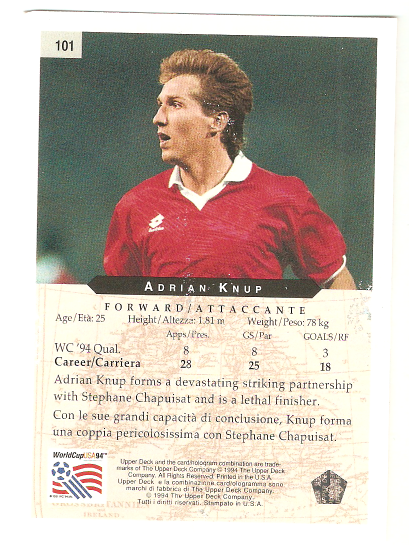 Adrian Knup, from the land of Fonts. He "is a lethal finisher." Put that and the White Branco (see above) and it sounds like OJ. 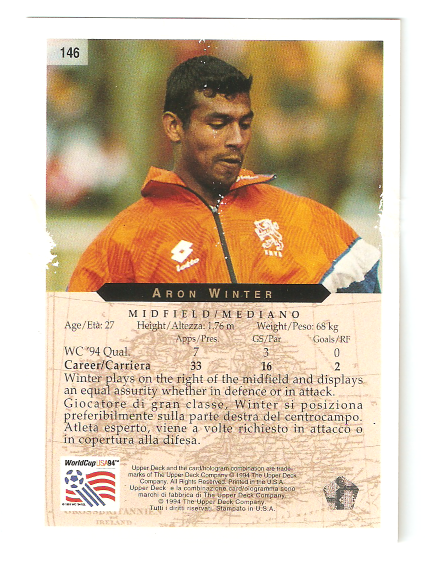 Fun fact about Aron Winter? 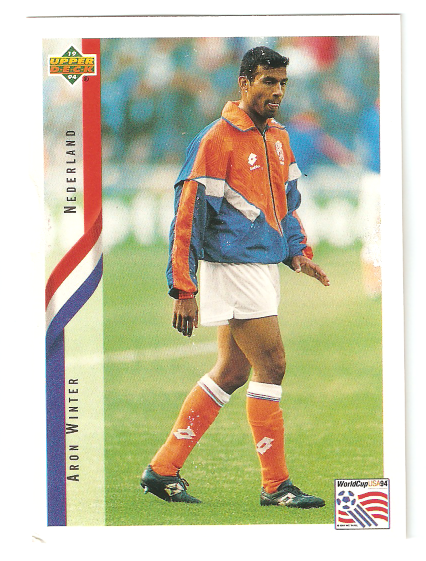 He has never been see without his warm up jacket. 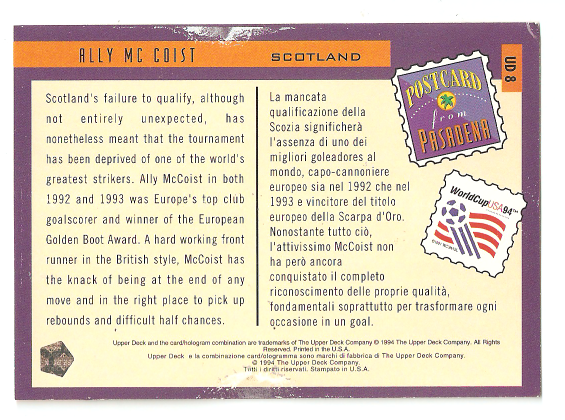 Ally McCoist. Rhymes with McMoist. 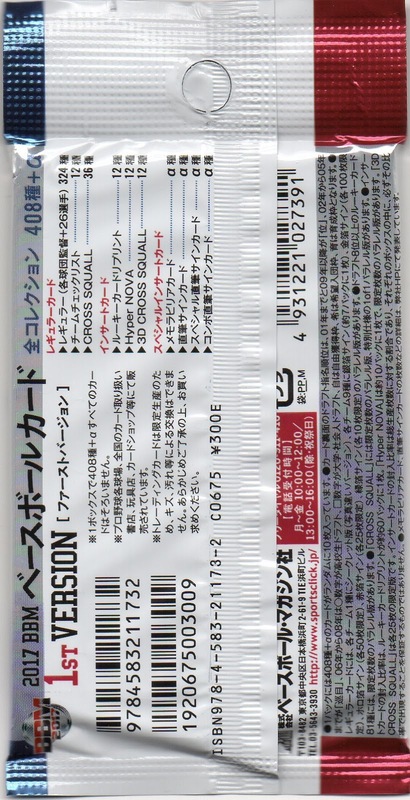 This insert set was in multiple languages. English with German. English with Italian. The Rose Bowl in Pasadena is where the final game was held. 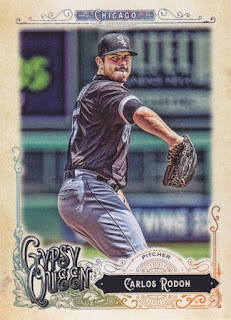 Hence the name of the insert set. A nice mix of action shots and stills. 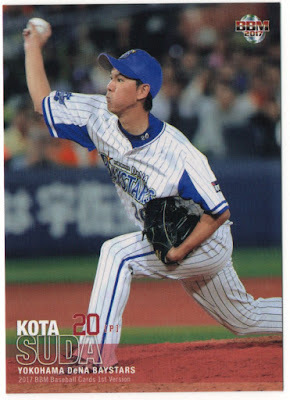 A plus is a different photo for the back of the cards. 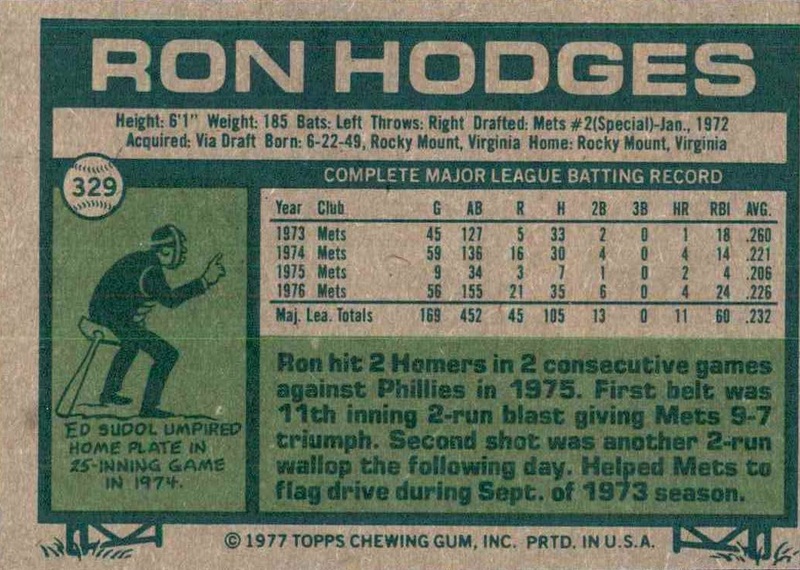 Typical glossy card stock and finish for Upper Deck cards of that era. I have no clue what a Lithogram card is. 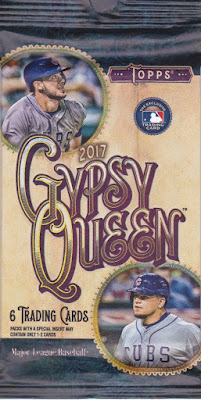 The latest Topps product to hit the shelves in 2017 is Gypsy Queen, which they've rolled out for the 7th consecutive year. This is a product I typically ignore, seeming to be at worst a replacement for the vastly superior Turkey Red and at best desperately trying to cram one more product into America's already bloated card hole. They've had some nice design concepts here and there, mostly with some of their inserts. This set is actually pretty nice looking in that the base cards don't really look like anything they've tried before. 153 - Logan Forsythe - This set is clearly cobbled together early in the Topps calendar, because Forsythe was dealt in the offseason to the Dodgers. 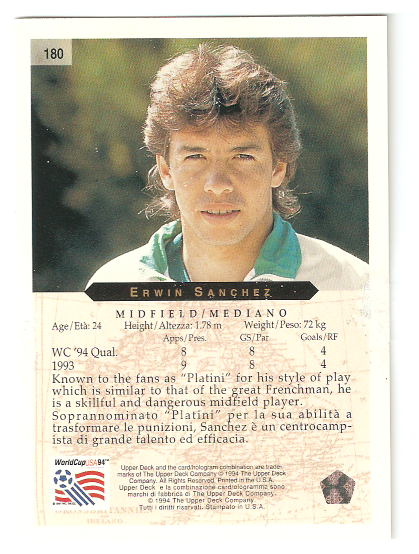 Again, I like the design, though the team name sans nickname makes it look a bit like Panini's licenseless offerings. 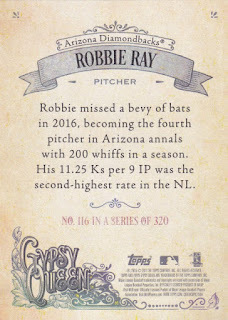 116 - Robbie Ray - The backs aren't bad. 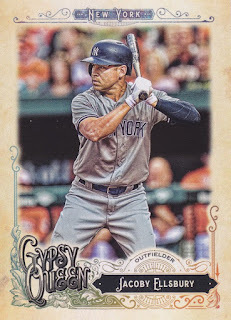 Large font size helps the old eyes, though this is also starting to look at bit like what would happen if members of The Decemberists designed a baseball card. 95 - Carlos Rodon - I can never keep Carlos Rodon and the other Chicago (Cubs) reliever, Hector Rondon, straight. 39 - Jacoby Ellsbury - Ellsbury is one of the greatest baseball players to ever come out of the state of Oregon, so it's rough to see people see him as The Contract now, even though I'm far removed from the Yankees/Red Sox rivarly. Still, his 2011 season has to be one of the weirdest one year blips of offensive greatness, on the level of Brady Anderson or something. 175 - Gregory Polanco - The Pirates outfielder who didn't do steroids or get bent out of shape over getting bumped out of center field. 225 - Jose De Leon - In a bit of coincidence, this is the guy that the Dodgers traded to get Logan Forsythe. 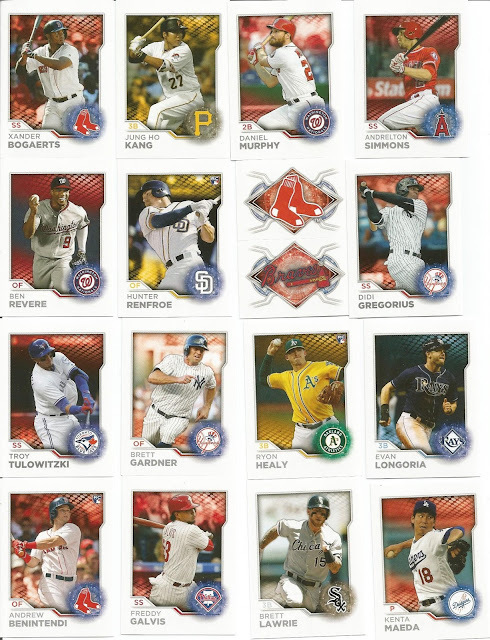 We are ripping at least one pack of every card product ever made. What can I say, we're ambitious. We'll try everything at least once. 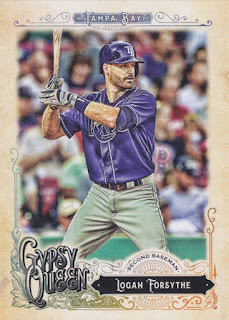 If you are interested in writing for A Pack To Be Named Later just shoot me an email at heartbreakingcards@gmail.com. Wax Wombat -- Wax Wombat!